Kaffeguide.se has gone mostly untouched since 2014, but this Christmas, I updated it with a new design, new functionality and new content. Christmas. It’s the time to relax with family and friends, eat good food, give and receive gifts – and squeeze in time for side projects. Last Christmas, I updated this website with a new design. This year, I decided to spend time on something else that has gone neglected for far too long. 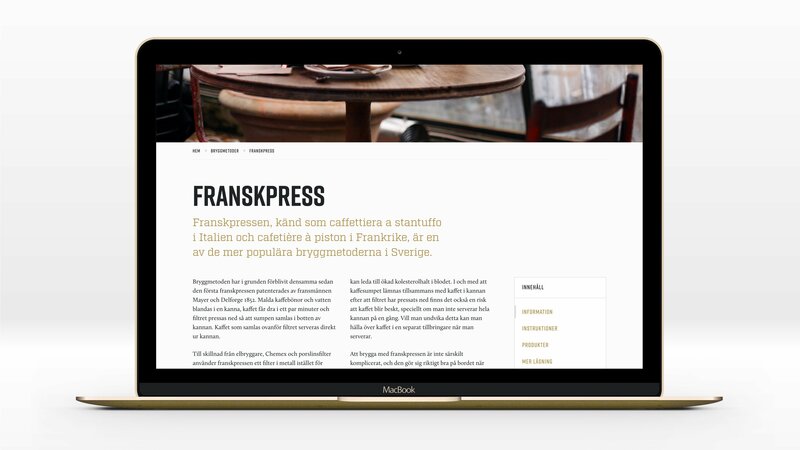 Kaffeguide.se, my website about brewing and serving coffee, has gone pretty much untouched since I launched it in 2014. Despite the lack of love, it has been climbing the Google results and getting more and more visitors at a steady pace. It seemed about time I did something to make it deserving of its visitors. Today, I released a new version of Kaffeguide.se with an all-new design, a couple of new bits of functionality and revamped content across the board. As it happens, I started working on the new version at about the same time as when I received my first espresso machine: a Gaggia Classic. I’ve been brewing with Chemex, french press and AeroPress brewers for a couple of years, but I’ve been hesistant to take the step to espresso. Spending the money on a espresso machine (and a grinder capable of grinding for it) wasn’t an option while I was studying. Early this winter, I took the leap. Espresso is an unforgiving brewing method. You need to get the beans, the grind, the brewing temperature, the tamping and the timing right to pull a good shot – not to mention learning how to steam milk properly. I had to sure up on the basics to get the espresso machine to do my bidding. That in turn caused me to revisit the Chemex, AeroPress and other brewing methods as well. I started using a scale, timer and thermometer for every single step. Making a small adjustment and tasting the difference in the cup is immensily satisying. Being a coffee geek is fun – don’t let anyone tell you anything else. I have a list of articles that I’m looking to add to Kaffeguide.se in the future, but that will have to wait until after the Christmas break. Finding time for side projects during the holidays is all well and good. Finding time for lying in the couch and playing Pokémon Moon is pretty good as well.